Amazon currently have £10 off the rather impressive 26,800 mAh portable charger that supports Qualcomm’s quick charge 2.0 specification for rapid charging. For those of you with an iPhone 6 you’ll get 10 full charges, with a Macbook 3 full charges. Samsung Galaxy S6? Seven full charges. 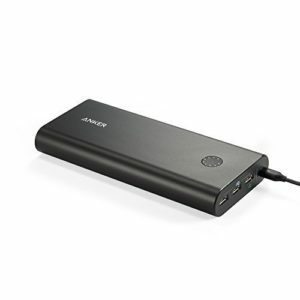 Using Qualcomm’s advanced Quick Charge 2.0 technology, the PowerCore+ allows compatible devices to charge 75% faster. Get up to 8 hours of use from just 15 minutes of charging. PowerCore+ 26800 is the world’s highest capacity portable charger with Quick Charge 2.0 technology. It charges the iPhone 6 ten times, the Galaxy S6 over seven times or the 2015 MacBook more than three times. .
• Compatible with the new 12 inch MacBook, 2015 (USB-C cable needed), Apple and Android smartphones, tablets (including the Nexus 7) and other USB-charged devices except for the iPod nano, iPod Shuffle, iPod Classic, HP TouchPad, Dell Venue 11 Pro, Asus tablets and some GPS and Bluetooth devices.